British engineer cosmonaut 1989-1998. Chemist. First British astronaut. First non-American, non-Soviet female astronaut. Status: Inactive; Active 1989-1998. Born: 1963-05-30. Spaceflights: 1 . Total time in space: 7.88 days. Birth Place: Sheffield. Bachelor of science in chemistry, 1984. Doctorate degree from Birbeck College, London. Worked at Mars Confectionery Ltd. Flew on commercial Juno mission to the Mir space station. One of three candidates from the United Kingdom in the 1992 ESA selection, but was not selected. Thereafter worked as a television commentator. Family: Cosmonaut. Country: UK. Spacecraft: Mir. Flights: Soyuz TM-11, Soyuz TM-11 Kosmoreporter, Soyuz TM-12 Juno. Agency: Mars Confectionery. Bibliography: 4452, 6018. 1963 May 30 - . Birth of Helen Patricia 'Lenochka' Sharman - . Nation: UK. Related Persons: Sharman. 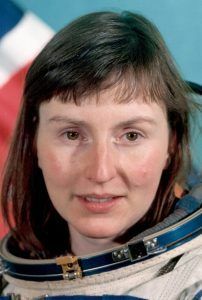 British engineer cosmonaut 1989-1998. Chemist. First British astronaut. First non-American, non-Soviet female astronaut. 1 spaceflight, 7.9 days in space. Flew to orbit on Soyuz TM-12 (1991)..
1989 November 25 - . British Commercial Cosmonaut Training Group selected. - . Nation: UK. Related Persons: Mace, Timothy, Sharman. The group was selected for the Juno commercial British cosmonaut mission..
1991 May 18 - . 12:50 GMT - . Launch Site: Baikonur. Launch Complex: Baikonur LC1. LV Family: R-7. Launch Vehicle: Soyuz-U2. Soyuz TM-12 - . Call Sign: Ozon (Ozone ). Crew: Artsebarsky, Krikalyov, Sharman. Backup Crew: Kaleri, Mace, Timothy, Volkov, Aleksandr. Payload: Soyuz TM s/n 62. Mass: 7,150 kg (15,760 lb). Nation: Russia. Agency: MOM. Program: Mir. Class: Manned. Type: Manned spacecraft. Flight: Soyuz TM-11, Soyuz TM-12, Soyuz TM-12 Juno, Soyuz TM-12 Mir LD-3. Spacecraft Bus: Soyuz. Spacecraft: Soyuz TM. Duration: 144.64 days. Decay Date: 1991-10-10 . USAF Sat Cat: 21311 . COSPAR: 1991-034A. Apogee: 397 km (246 mi). Perigee: 389 km (241 mi). Inclination: 51.60 deg. Period: 92.40 min. Docked with Mir. Mir Expedition EO-09. 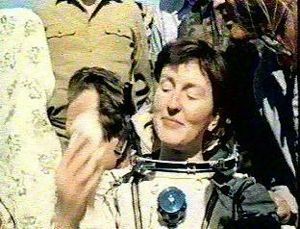 Carried Anatoli Artsebarski, Sergei Krikalev, Helen Sharman to Mir; returned Artsebarski, crew of Soyuz TM 8 to Earth. Second commercial flight with paying British passenger. Sponsoring British consortium was not quite able to come up with money, however. Flight continued at Soviet expense with very limited UK experiments. 1991 May 26 - . Landing of Soyuz TM-11 - . Return Crew: Afanasyev, Manarov, Sharman. Nation: Russia. Related Persons: Afanasyev, Manarov, Sharman. Program: Mir. Flight: Soyuz TM-11, Soyuz TM-12, Soyuz TM-12 Juno, Soyuz TM-12 Mir LD-3. Soyuz TM-11 landed at 10:03 GMT with the crew of Afanasyev, Manarov and Sharman aboard..